My outfit today was inspired by the ever stylish Miroslava Duma. Isn't she lovely? I super love her style!!! I was suppose to wear sandals with this outfit but my cankles won't allow the straps to close so I have no choice but to wear flip flops. Hehehehe. Oh and the winners for my first giveaway (jackets) will be announced soon! :D So look out for that! i love your inspiration for this outfit. Miroslava is a fave of mine. you look ultra-cute! and i can't wait to see your baby! What an adorable inspiration outfit. :) You and your baby bump are sooo cute. I love how pregnancy can still be so stylish. 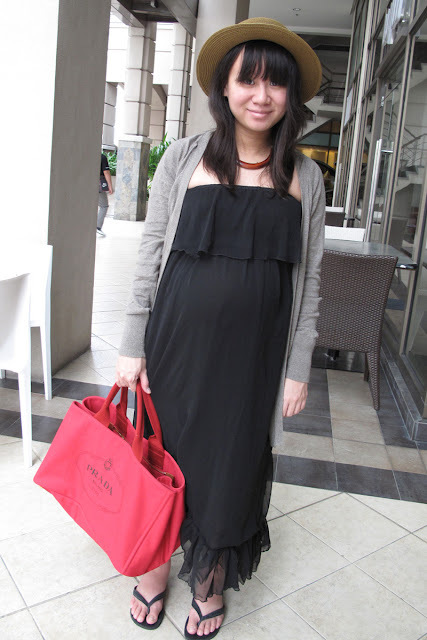 You're proof that even when you're pregnant you can and should look fabulous! Lovin' your blog, will definitely be back for me. And yay, I'm a new follower too! p.s. I've been on a hunt for a pair of oxfords.. too bad I can't enter your contest. Looks like a fun one though! I love the red canvas Prada tote bag...Ohh I am craving for the Blue one....patience my dear!!! can't wait for the winners crossing my fingers!!! you totally rocked this look babe! and oh, how i looooooove miroslava duma!